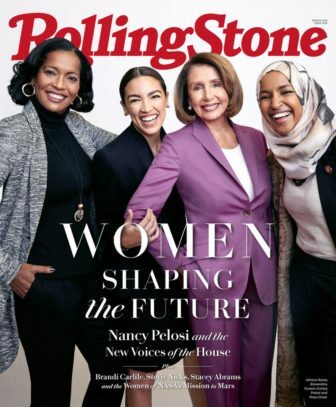 Jahana Hayes recently appeared on the cover of Rolling Stone magazine with U.S. Reps. Alexandra Ocasio-Cortez, D-N.Y., and Ilhan Omar, D-Minn., and House Speaker Nancy Pelosi. Updated 8:15 p.m. with Hayes comment. Washington – Rep. Jahana Hayes has not yet cleared her first 100 days in office, but she’s already the target of a political attack ad. A new group called Freedom Project USA released a YouTube video Tuesday attacking Hayes, D-5th District, for her support of the Green New Deal, an aspirational Democratic proposal that aims to combat climate change and work toward social justice. The 30-second spot flashes a picture of Hayes – and of the Green New Deal’s House sponsor, Rep. Alexandria Ocasio-Cortez – with a voiceover that says the Green New Deal could cost $93 trillion. The ad compares the Green New Deal to the FYRE festival, a music festival in the Bahamas whose organizers were totally unprepared for the customers they lured to the island. Hayes responded to questions about the ad Tuesday night. Matt Wylie, president of Freedom Project USA, is a Connecticut political consultant who worked on the former Republican Rep. Chris Shay’s failed bid for the U.S. Senate in 2012. Wylie also worked on the 2016 U.S. Senate campaign of Republican August Wolf, who like Shays was defeated at the state’s Republican convention. He said his group will create additional attacks ads aimed at other Democrats, mostly in New England. Freedom Project USA is classified as a a 501(c)4 education organization by the Internal Revenue Service and does not have to identify its donors. Wylie declined to identify them, too, saying the group is funded by “several private donors” who live both in Connecticut and outside the state. Like Wylie’s group, Republicans in Washington D.C. have used the Green New Deal, which they call an economy busting socialist manifesto, to try to bludgeon Democrats. Senate Majority Leader Mitch McConnell held a vote on the Green New Deal in the Senate last week to put Democrats — especially the many in the Senate who are running for president — on the record regarding the controversial plan. The vote failed after all Republicans voted “no” and most Democrats voted “present,” including Connecticut Sens. Richard Blumenthal and Chris Murphy.